Get ready for colors, energy and many creative ideas to use in your own journals. 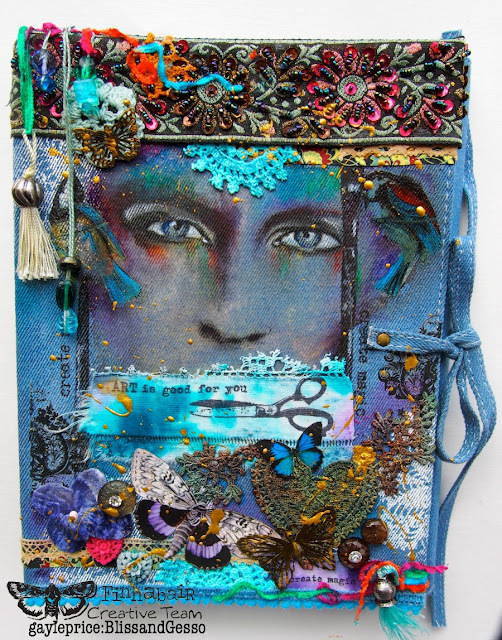 You will love this journal's vibe! Hello lovely Finnabair friends. 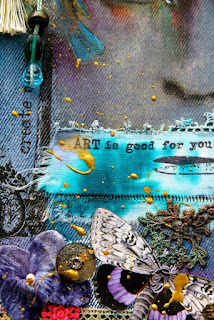 This month I have worked on the cover of my beautiful little Finnabair Denim Art Journal. 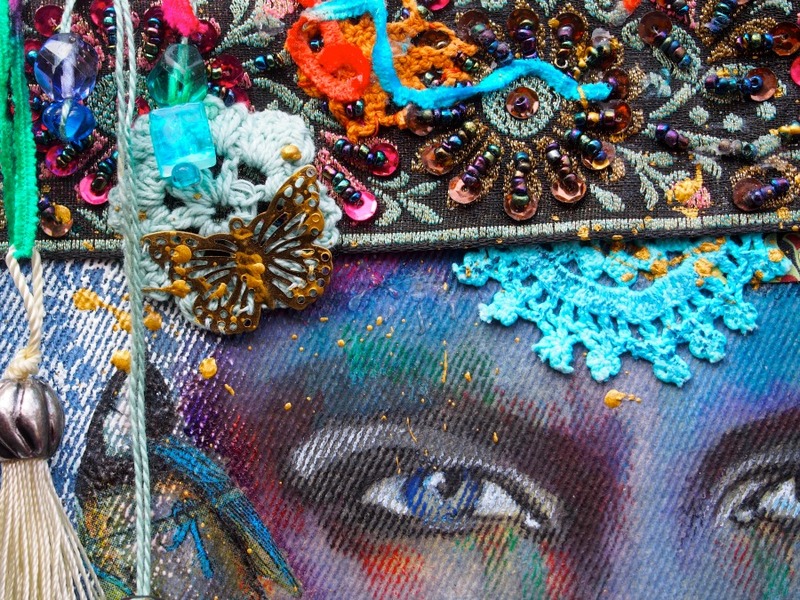 Denim always reminds me of the 60's, so I have gone down the denim, boho chic path and used layers of denim, linen and lace, flowers and nature, fringing and beading, ethnic patterns and rich colours. Don’t be apprehensive about decorating this journal because the surface is “denim”. 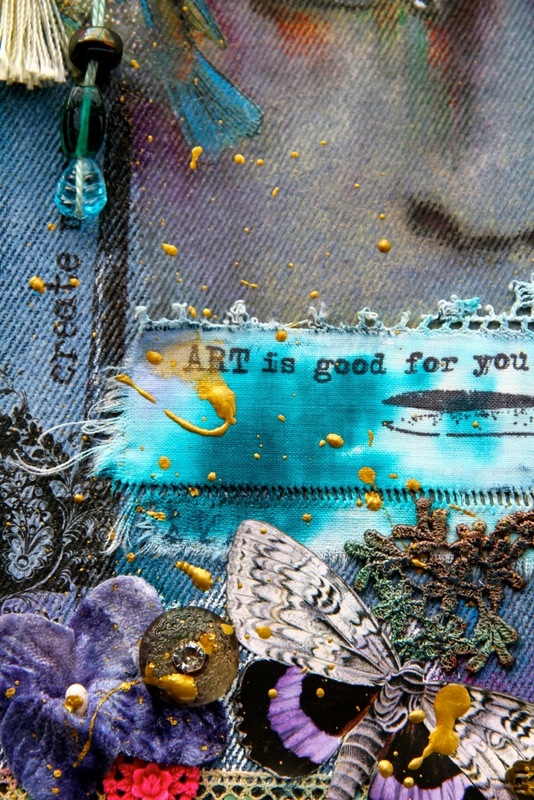 Denim is closely related to “canvas”, so whatever you can do on canvas, you can pretty much do on denim. You need to first prime the surface with a coat of Clear Gesso. If you'd like to see exactly what the journal looks like, Kasia made this helpful video a while ago. 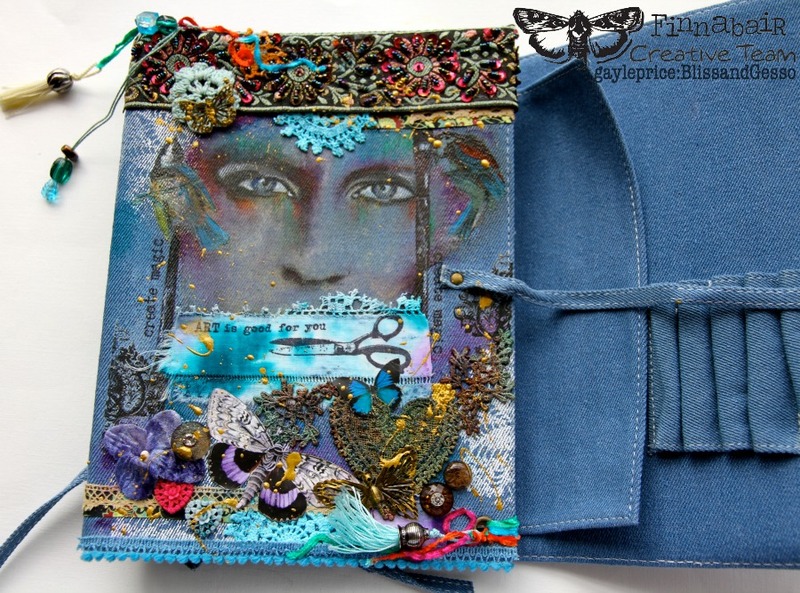 Inside this journal you will find a number of pages: denim, canvas, a plastic sleeve and watercolour sheets. I used the denim sheet inside the journal to experiment with different mediums and techniques - that’s what journals are for after all. Here I have numbered the different techniques and mediums I tried first in the journal and then used on the front cover. Remember first to give the denim surface a coat of Clear Gesso and dry it. 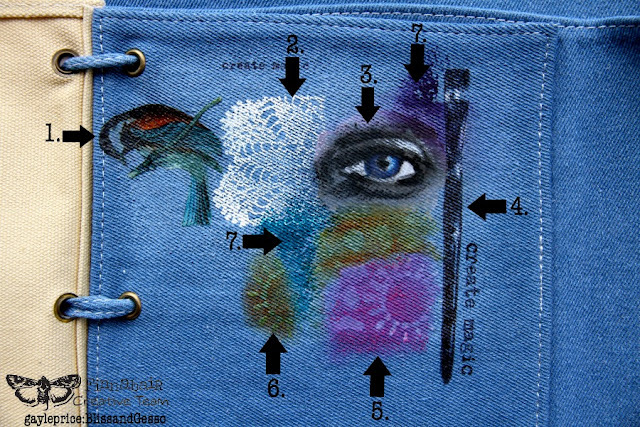 No.1 The bird is cut from a paper napkin and just collaged onto the denim with Soft Matte Gel. No.2 Vintage Vanity “Frilly Lace” clear stamp has been embossed onto the surface using embossing stamp pad and white embossing powder. No.3 Black and white image transfer using a photocopied image with Soft Matte Gel. I added some black, white and blue colour to the image with Lumocolor glasochrom pencils. These pencils are very soft and a little bit “oily” and work really well on this surface. No.4 Just a stamped image - Prima mounted stamp “Brush” using black StazOn ink. No.5 Finnabair “Doily” Stencil used with 3D Gloss Gel (which is transparent) and then coloured with Prima Water Soluble Oil Pastels. Wipe over the oil pastel with a baby wipe - this does two things: it “wets” and activates the oil pastel to dissolve and flow as well as removing it from the “resist” surface of the Gel Medium, so highlighting the pattern. No.6 The same “Doily” Stencil used with 3D Gloss Gel and coloured with acrylic paint and again wiped over with a baby wipe. No. 7&8 Liquitex ink painted on with a brush and diluted in parts with water. All the mediums and techniques mentioned above were used along with some rub-ons, some stamped linen, lace, beads, flowers, paper and other embellishments. 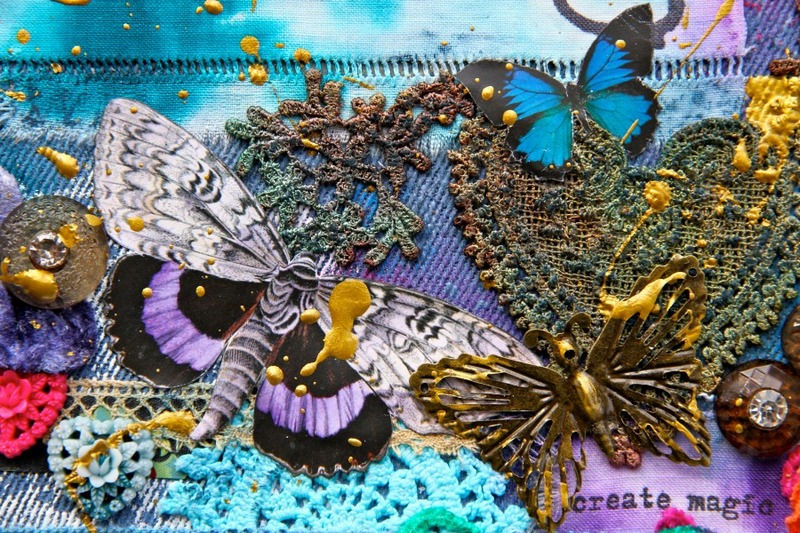 Finnabair’s beautiful Grungy Butterflies from her Mechanicals range were great to use on this soft journal as they are fine, delicate and light. The splotches and splatters of gold come from Finnabair’s Art Alchemy Acrylic Paint in “Metallique Ancient Coin”. Such a beautiful thick, shiny paint… so easy to add pops of colour and texture with. Thank you for sharing my journal cover journey, I hope you can create some magic with yours, but for now I wish you “peace”. Gayle - you've transformed the denim cover into a beautiful piece of art - and it does take me back to bell bottoms, beads and Volkswagen buses decked out as campers! It is stunning! Incredible detail and you have captured the essence of those days.